Archeology is a living and vibrant field, constantly unearthing “the earliest” and “the oldest”. Likewise, research into the earliest writings and references is an ongoing endeavor, with new findings emerging as more texts are translated, scanned, and indexed. This article represents my best understanding, based on the references and resources available to me as of the most recent update of this page ( April 1, 2017). In the future, new information will surely emerge! Our understanding of the history of flutes in their oldest forms comes almost exclusively from the study of ancient musical instruments. Aside from an appreciation for how long we have had a love affair with this instrument, this study has provided new ideas and directions for flute makers. It has spurred the rebirth of some of these ancient instruments in modern times, especially the Anasazi Flute. For flute players, the main value comes from the more recent work of anthropologists and ethnomusicologists, who began studying and preserving Native American musical traditions in the mid-1800's. This helps us understand and appreciate the wide gulf between the style of music that surrounded the flute and European musical traditions of the time. It also gives us a hint into the modes and scales that may have been in use at these times. Archeology tells us that flutes have been part of human culture for at least 35,000 years. We have flutes from sites in Germany, France, China, Egypt, and Greece that give us clues about the development of music in the human species. Modern Humans (Homo sapiens), who have lived from about 250,000 years ago, and had just migrated from Africa up into the limit of the ice sheet in Europe. Cro-Magnon Man is the term used for early modern man in Europe during the time of the first flutes. At this time, the Earth was in the middle of the most recent ice age, with average temperatures 6°C (11°F) colder than now ([Petit 1999]) and the ice sheet extending as far South as Kansas, Long Island, Southern England, and Northern Germany ([Ehlers 2007]). Cro-Magnon Man had developed language ([Johansson 2006] ), most likely only recently ([Wade 2003]), and the pace of change in the development of humans was accelerating. The current thinking is that the development of tools proceed in discreet steps up until about 40,000 to 50,000 years ago. Each step was associated with a distinct predecessors species to Neanderthal Man (Homo habilis and Homo ergaster). Within one step of tool development (and one species), little change occured in the design of the tools. However, starting about 50,000 years ago, the pace of change greatly accelerated - a phenomenon that is popularly called “The Great Leap Forward” ([Diamond-J 1992], [Henshilwood 2004]). There are many competing theories as to what caused this change ([dErrico 2005]), but it is clear that modern humans developed sophisticated hunting techniques, clothing, innovations in shelter, and began burying their dead. They also started exploring abstract ideas and symbolism, beginning with cave painting ([Ambrose 2001]) and creating musical instruments. Phalanges [fa-lan-jeez] are the small bones of the fingers and toes. One finger or toe bone is a “phalanx”. Archaeologists have uncovered many phalanx bones that were crafted by prehistoric humans for some purpose - adornment (as on a necklace), symbolic (as figurines), or possibly as musical instruments — called “phalangeal whistles”. These bones are hollow on the inside (after any marrow or soft matter is removed) and a single hole in the proper place would be sufficient for them to be used as a tiny, closed-vessel flute. Many bones with a hole in the right spot have been found. However, there is a mountain of study and debate as to whether those holes were intentionally crafted by humans, chewed by carnivores, eaten away by gastric juices after having been chewed, or the result of a puncture by a sharp stone after having been buried in a gravel pit that was stepped on ([Caldwell 2009]). … the whistle from Laugerie-Basse, taken from Lartet and Christy’s Reliquiæ Aquitanicæ … is described as the first digital phalange of the hind foot of a reindeer. A hole has been bored in its lower surface near the expanded upper articulation. On application of the lips to the hollow of this articulation, and blowing obliquely into the hole, they got a sharp sound analogous to that produced by a cat call or a key used as a whistle. These artifacts are predominantly dated in the range 15,000 to 10,000 BCE, with some dates as old as 30,000 BCE. That's old, but not all that old in the scheme of more recent discoveries. 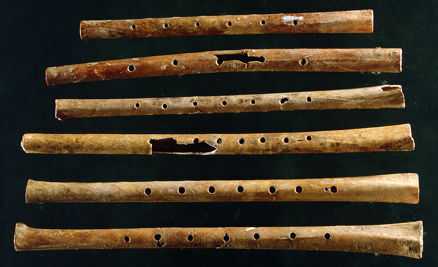 For similar flutes excavated in North America, see Ohio Valley Flutes. Divje Babe [deew-yeh bah-beh] is an archeological park Northwestern Slovenia that has produced many artifacts from Neanderthal inhabitants (see [Culiberg 2011] for a map showing the detailed location). 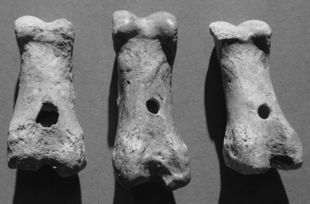 In 1995, a team led by Ivan Turk uncovered a fragment from the thigh bone of a young cave bear, and proposed that this had been crafted as a flute ([Turk 1997]). This proposal set in motion a heated controversy regarding the claim to the world's oldest flute ([dErrico 2003] ). Was this artifact crafted as a flute? Or were the spaced holes the result of chewing by a carnivore? Could the Neandrethal culture, which had produced no other examples of musical instruments, crafted a flute? There has been an amazing amount of analysis, discussion, debate, and disagreement on the subject, and the debate continues today (see [Morley 2006] for an overview). The debate is particularly significant, since it would be the first occurence of a confirmed musical instrument constructed (and, presumably, used) by Neaderthal Man. The Divje Babe artifact is 43,100 years old (±700 years), based on radio-carbon dating ([Morley 2003] , page 47, citing [Nelson 1997]). This was during the middle of the most recent Ice Age, with temperatures about 5.8°C (10.4°F) colder than today (Vostok ice core measurements from [Petit 2001] ; see also [Petit 1999]). 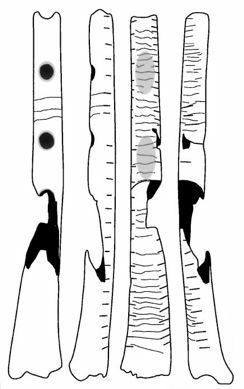 The location of the discovery of the flute was at the edge of the ice sheet that extended down across present-day Europe ([Andric 2011] and [Pohar 1994]). The artifact is currently on display at the Narodni Muzej Slovenije (National Museum of Slovenia) in Ljubljana. It is 4.47" (11.36 cm) in length and is broken at both ends. It has two complete holes and what may be the incomplete remains of one hole on each end, meaning that the bone may have had four or more holes before being damaged. The maximum diameters of the two complete holes are 0.38" and 0.35" (9.7 mm and 9.0 mm). 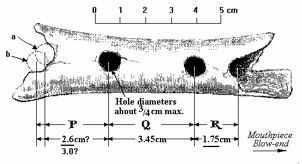 The distance between the centers of the holes is 1.38" (35 mm). with an open-hole, diatonic flute, by Bob Fink. The oldest artifact that is generally accepted to be a flute was discovered in September 2008 in the Hohle Fels cave near Schelklingen in Southern Germany. The team that excavated the flute was led by archaeologist Nicholas Conard of Universität Tübingen in Germany ([Owen 2009] ). The flute was fashioned from the wing bone of a Griffon vulture (Gyps fulvus) and has five finger holes and a V-shaped mouthpiece. The preserved portion of the artifact has a length of 21.8 cm (8.58″) and a diameter of about 8 mm (0.3″) ([Conard 2009]). It was originally about 13″ (34 cm) long. The age of the Hohle Fels Griffon Vulture flute was originally placed at between 35,000 and 40,000 years ([Wilford 2009]). However, radiocarbon tests at the University of Oxford in England determined that animal bones found with the flutes were 42,000 to 43,000 years old ([Higham 2012]). This is close to the time when the first anatomically modern humans were spreading into Central Europe, presumably along the Danube River valley. Bird bones are a natural starting point for flutes — they are strong and are mostly hollow. Nicholas Conard makes a case in [Conard 2009] that this flute supports theories about the role of music in the life of early modern humans (Homo sapiens). Conard proposes that ancient flutes demonstrate an early musical tradition that helped the first modern humans settlers in Europe form tight social bonds and develop Stone Age social networks. This allowed for greater societal organization and strategizing. Conard also proposes that music was a cultural accomplishment that helped early modern humans compete against Neanderthals (Homo neanderthalis) the cousins of modern humans who became extinct several thousand years after the Hohle Fels Griffon Vulture flute was crafted. Wulf Hein. Replica of the Hohle Fels Griffon Vulture flute. This song was incorporated into an interesting NPR/All Things Considered segment “A Little Flute Music To Warm The Cave” ([Harris-R 2009]) that you can hear on the Web. A series of flutes styled along the lines of the Hohle Fels Griffon Vulture Flute are made from bamboo by Erik the Flutemaker. Visit his Ice Age Flute page, complete with an entertaining YouTube video about the flute. A flute that is probably slightly more recent was made from the wing bone of the graceful and currently endangered Whooper Swan (Cygnus cygnus). This flute was pieced together from 20 bone fragments excavated by Joachim Hahn and Susanne C. Münzel in the Geißenklösterlen [gahy-sen-kloe-ster-len] cave in Southwest Germany, near the small city of Ulm on the Danube river ([Hahn 1995]). 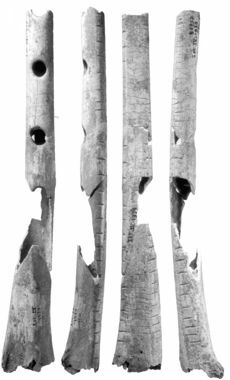 The flute is 4.98" long (12.65 cm) with three finger holes and has been dated to between 33,000 and 37,000 years old ([Munzel 2004], page 227). This is an excerpt from track 14 from the CD Klangwelten der Altsteinzeit (“Sound World of the Old Stone Age” - ©2003 Urgeschichtliches Museum Blaubeuren) that Seeberger played and recorded in the Hohle Fels cave ([Seeberger 2003]). Also from the Geißenklösterlen cave near Ulm, Germany is a flute made of mammoth ivory tusk ([Conard 2004]). It was pieced together from 31 fragments and measures 7.36" (18.7 cm) long. The deposits from where the fragments were excavated was dated to a range from 30,000 to 37,000 years ago ([Schneider 2004] ). Creating a flute from solid ivory of a mammoth required far more skill than starting from the hollow wing bone from a swan. The curved mammoth tusk had to be split without damaging the two halves. Each half had to be hollowed out. Then the halves needed to be glued back together with no air leaks along the seam. ... a very impressive collection of Upper Paleolithic flutes (or pipes) from Isturitz in southwestern France. Consisting of more than twenty separate specimens, the Isturitz flutes range widely in date from the Aurignacian to the Magdalenian (between ca. 20,000 and 35,000 years ago). Two of the most complete pipes are from the Gravettian levels of the cave, ca. 25,000 years ago. They are extremely well made of vulture ulnae, bear finely etched identifying or notational marks, and display evidence of having been extensively used. From the outset we were struck by the pipe’s sophistication. Although archaeologists have sometimes been tempted to classify these things as “simple,” even “primitive” instruments, close inspection revealed some intriguing musical choices and functional asymmetries. Bearing in mind how very ancient they are, with a date-range currently estimated, for most of them, at between ca. 20,000 and 35,000 years, these seemed remarkably advanced, and clearly justified careful reevaluation. This Isturitz bone flutes above and below are attributed to the Gravettian culture, which would place them between 28,000 and 22,000 years ago. The flute above is artifact 83888(a)/75252-A3 [DB 2] from [Buisson 1990] and the flute below is artifact 86757(a) [DB 5.1] from the same reference. 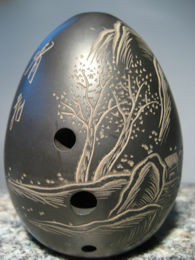 The gray shading around the finger holes shown on the drawings at the right indicate concentrations of polish that are interpreted as wear from playing. See [Buisson 1990], [Vianello 2004] page 5, and [dErrico 2003] pages 39–48 for a more complete description of these flutes. 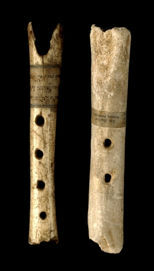 The P&EE Christy Collection of the British Museum has two bone flutes of uncertain age, but are “about 32,000 years old”. They are from rock shelters at La Roque and Les Roches, Dordogne, France. The La Roque flute has “five holes on the front and two on the back” and the Les Roches flute has two holes. Both flutes are 12.400 cm (4.88") long. 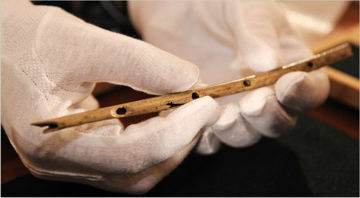 A earliest flutes from China were excavated in 1986 from a tomb in Jiahú, Wuyan County, Henan Province, Central China. This area was inhabited from 7000 BCE to 5700 BCE. The tomb had been stocked with more than 30 flutes, and the excavation yielded six beautifully crafted complete flutes in addition to many fragments of other flutes. The style of these flutes is called the “gudi” (literally “bone flute” in English), and collectively these flutes are know as the Jiahu Gudi (贾湖骨笛) ([Zhang 1999]). Some musicians still play this style of flute today. The flutes have been radio-carbon dated to between 5750 BCE and 5620 BCE. 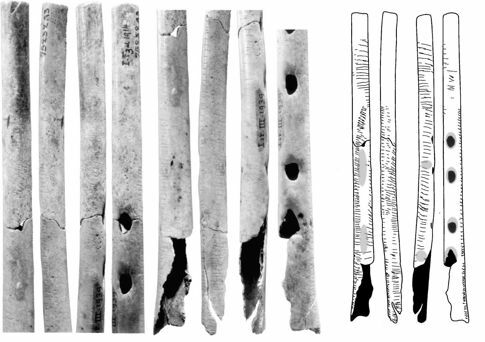 Six complete bone flutes excavated from Jiahu. The second flute from the bottom is M282:20. These bone flutes have average dimensions of approximately 7.9"×0.4" (20 cm × 1.1 cm), and are made from the wings of the Red-crowned Crane (Grus japonensis Millen). They are open-ended and vary in the number of their finger holes. The 8-holed version has seven holes in front and one thumb hole in back. M282:20 is the best preserved flute and is free of cracks. It has seven main finger holes plus a tiny hole hear the seventh (bottom-most) hole. The small hole was probably put there to adjust the pitch of the seventh hole. 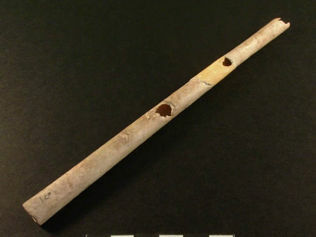 The Jiahu bone flute was a sacrificial object. There are two flutes in one grave. The grave is a relic of the early Jiahu Culture (7737±123 years before present2 by radio carbon date). The length of the bone flute is 22.2 cm. The tube pitch is rested as #F5 + 44, the seventh hole A5 +8, the sixth hole B5 -25, the fifth hole C6 +24, the fourth hole D6 +16, the third hole E6 +16, the second hole G6 -40, and the first hole #A6 -42. 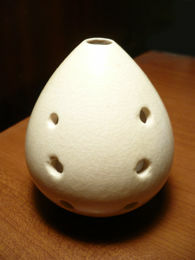 Therefore the bone flute plays both the five or seven-notes scale of Xia Zhi and six-notes scale of Qing Shang of the ancient Chinese musical system. Taoying Xu. Jiahu Gudi 282:20. Another of the Jiahu Gudi, on display at the Henan Provincial Museum. The earliest written mention of a flute comes from a cuneiform tablet that is now in the collection of the Vorderasiatisches Museum, Berlin, Germany. 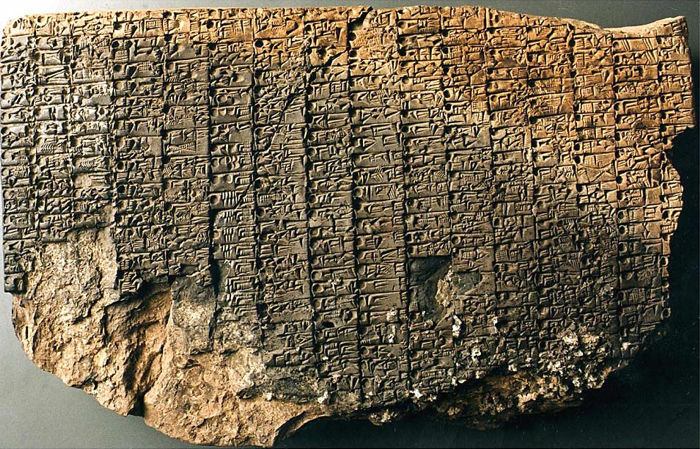 The tablet was written (or more accurately, stamped into wet clay) in about 2600–2500 BCE in Sumer, in the Southern Mesopotamian valley in present-day Iraq. 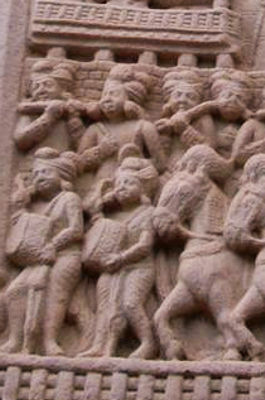 The tablet refers to the "gu-di" or "gi-di", a type of flute. The Sumerian civilization is considered to be the birthplace of agriculture (about 5300 BCE) and writing (around 3500 BCE). A wealth of information about music-making in the Sumerian culture circa 2600–2350 BCE comes from excavations of the Royal Cemetery of Ur led by Sir Leonard Woolley ([Cheng 2009] ). The archaeological site yielded many musical instrument, predominantly harps and lyres from royal and private grave sites. Silver flute from tomb PG 333. Ur ± 2500 BC. Beside the stringed instruments flutes were excavated from the royal tombs. The instrument might have had a reed mouthpiece. It certainly covers a diatonic scale, possibly from C-D-E-F-G-A. In PG/333 there were found what seemed to be bars of silver wantonly twisted and bent. These were scientifically cleaned in the University Museum and proved to be of great interest. The apparently meaningless mass consists of silver tubing, with a total length of 0.408 m. (16.06″); it is broken into five pieces, but may originally have consisted of two parts each of an approximate length of 0.260 m (10.24″). Along one side of each there are five (?) holes 0.006m. (0.24″) in diameter placed at intervals of 0.025 m. (0.98″); the last hole comes at 0.025 m. (0.98″) from the end of the tube, and the first at 0.14m. (5.51″) from the unbroken end which may be the mouthpiece. At 0.07 m. (2.76″) from the (complete) end of one tube there is a double incised band, and a similar band on the second tube close to its broken end. U. 8605. There can be no question but that we have here the remains of one of the double pipes figured on Sumerian carvings, e.g. to take a late instance, on the great stela of Ur-Nammu; the slenderness of the pipe suggests that it is directly inspired by its original, the reed of the marshes; the intervals may help to throw light on Sumerian music as a whole. Here is an excerpt of a piece played on a reconstruction of this silver double flute, accompanied by a reconstruction of an eight-string lyre, which was excavated from the same tomb. The double-flute was reconstructed by Bo Lawergren and played by Barnaby Brown, the lyre was reconstructed by Andy Lowings and played by Bill Taylor, and this piece was produced by Mark Harmer in October 2007. The reconstructed double flute has the same five notes on both sides, and Barnaby Brown describes the tuning as “roughly equal intervals - 180 cents ± 15, or a fifth divided into five roughly equal steps - as this is common around the Arabic world and West Africa”. You can view the full track and video on YouTube, and get more information (and purchase CDs) at the Lyre of Ur web site. Barnaby Brown and Bill Taylor. 2007. Reconstructed Silver Double-Flute of Ur. A culture developed before 4000 BCE on the Cycladic islands of the Aegean Sea, now part of present-day Greece. It was supported by fishing, small livestock, and farming emmer wheat, a staple crop that is called “triticum” or “farro” in present-day Italy. This type of wheat was one of the first domesticated crops, but requires milling or pounding to release the grains from the harvested plants. This farming culture grew into the Cycladic Culture that thrived from approximately 3200 BCE to 2000 BCE. In the late 19th century, two marble statues were discovered in a single grave on the island of Keros (Κέρος). 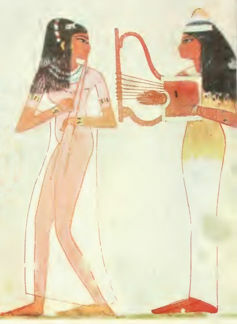 They depict a standing double flute player and a sitting musician playing a triangular-shaped lyre or harp. 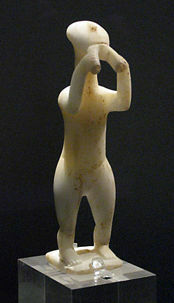 The figures are made of Parian marble and date to approximately 2700–2500 BCE. These figures are now on display at the National Archaeological Museum of Athens. Music was clearly a well-developed aspect of Cycladic life. Could their music have been spurred by the rhythms that must have arisen from the daily tasks of milling or pounding grain? An excavation of The Temple of Hierakonpolis in 1898 unearthed a carved “palette” of stone depicting ornate animal scenes on both sides, including two large Cape Hunting Dogs. 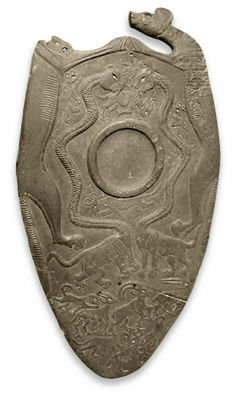 The palette dates to about 3200–3050 BCE and is knows as the “Two-Dog Palette” or “Animal Ceremonial Palette of Hierakonpolis” [MacGregor 2000]. It measures 42.5 cm × 22 cm (16.7" × 8.7"). The front side of the palette is shown at the right. The reverse side “portrays life allegorically as an unequal conflict between the strong and the weak, seemingly animated by the flute-playing presence of the Seth-like figure in the bottom left corner.” [Kemp 1991]. 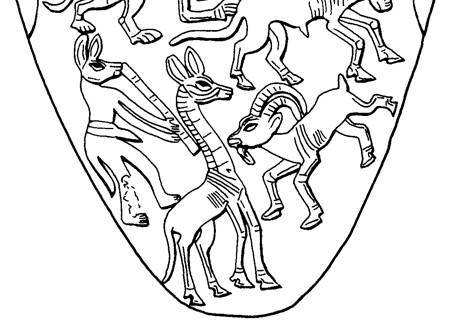 Another interpretation, from [Bromiley 1986], volume 3, page 437, ¶6, is that it depicts “a fox playing an end-blown flute, accompanied by a dancing giraffe and ibex”. The Two-Dog Palette is displayed at the Ashmolean Museum in Oxford England (item E.3924). The drawing below of the reverse side is by Marion Cox from [Baines 1993]. 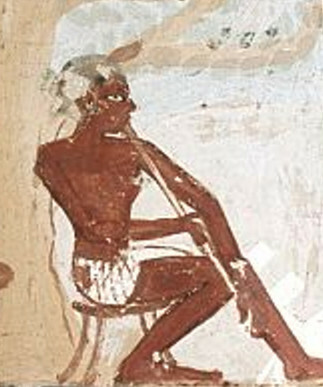 It depicts a detail of the portion showing the flute player. Click on the image for a full-size drawing of the entire palette. 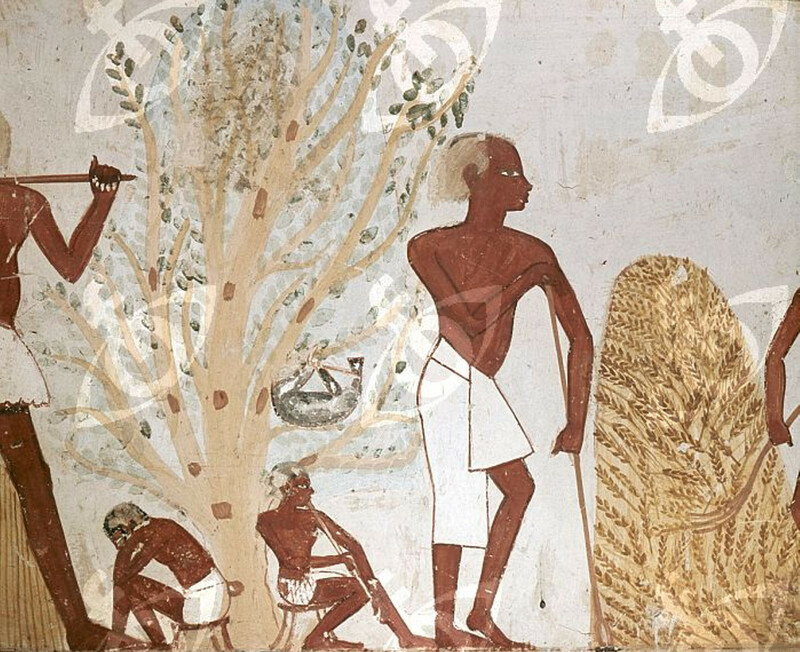 The painting on the right is an excerpt from a scene on the wall of the tomb of Djeserkara Amenhotep I (1515–1494 BCE), from [Badawi 1960], which would date to about 1490 BCE. In 1890, Thomas Lea Southgate did extensive analysis on a flute excavated from a tomb, including creating replica instruments and measuring their pitches. See the reference [Southgate 1891] . Two flutes from Alexandria, Egypt, 305–30 BCE. Photo: Werner Forman Archive. 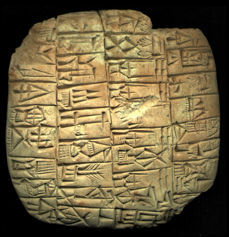 An early written record of music and musical instruments is from the 26th century BCE. It is written in Sumerian inscribed in clay and comes from ancient Sumer, in the Southern Mesopotamian valley in present-day Iraq. The tablet lists the individual names of nine music strings of the ki-na-ru, a Semitic word that became the Hebrew word kinnor, a type of lyre. It also lists intervals between the notes and describes a tuning procedure for the instrument to obtain seven scales ([Civil 2008], pages 3 and 93–103, and [Civil 2010], pages 203–214). 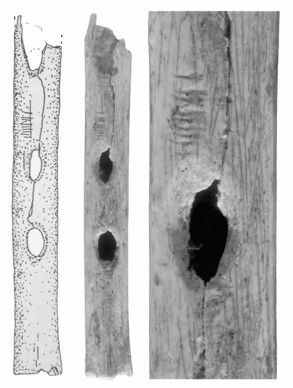 The oldest wooden wind instruments were uncovered in the winter of 2003 in Wicklow near the East coast of Ireland. The “Wicklow Pipes” are straight wooden tubes that form a kind of large pan pipe. A carbon dating test placed them at 2167±30 BCE (carbon dating age 4170±30 years). This was was at the transition from the Stone Age into the Early Bronze Age ([ODwyer 2004]). 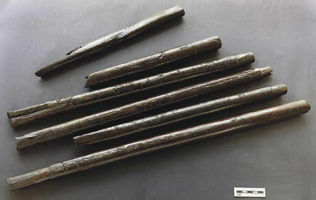 A wood-lined pit contained a group of six flutes made from yew wood, between 30 and 50cm (11.8" and 19.7") long, tapered at one end, but without any finger holes. They may once have been strapped together. Other than this information and the photograph shown at the right, I have no information on this instrument. If you have any details on this artifact, please contact me. the 壎 (“xūn” [shuon] or “xuān” or “hsuan” - (CTP)), a small pottery vessel flute, shown in the two photos below. The poem is from 詩經 (“Shī Jīng” or “Shih Ching” or “Shih King” - The Book of Songs or The Book of Poetry - (CTP)). The Book of Songs is a collection of 305 poems written between 1766 and 586 BCE, before the time of Confucius ([Legge 1879], page 276). This particular poem is from the 大雅 (“Ta Ya” or Greater Odes of the Kingdom - (CTP)), “a collection of pieces sung on great occasions at the royal court and in the presence of the king” ([Legge 1879], page 277) that were composed around the ninth century BCE ([Mather 2003], page 112, footnote 1). See the entire translation of this poem on the CTP web site. Ancient Chinese texts provide the earliest development of many musical ideas, including the classification of instruments, analysis of the effects of pitch, and the development of scales. See [Chen 1996], Chapter 2, for an extensive analysis of early Chinese texts in relation to music, as well as additional material in [Price 1992] . Musical instruments were well established in the Middle East at the time of the early biblical texts, and there are many direct references to music in general and flutes in particular. There are many points of view as to the age of the early texts of the Bible. It is generally agreed that the content began as oral tradition and was later recorded, mostly in classical Hebrew for the Old Testament books and classical Greek for the books of the New Testament. The traditional view as to the age of the bible is based on the chronology given in the Hebrew Bible itself. It says that the first fives books of the Old Testament, which make up the Torah, were written between 1446 BCE and 1406 BCE. Many other schools of thought exist, including the Documentary Hypothesis [Wenham 1996] , which identifies four authors who began writing 950 BCE and completed revision in 450 BCE. The Copenhagen School (aka “Biblical Minimimalism”) ([Davies 1998] and [Schniedewind 2008]) is at the other end of the scale of proposed dates, placing the first five books between 300 BCE and 140 BCE. 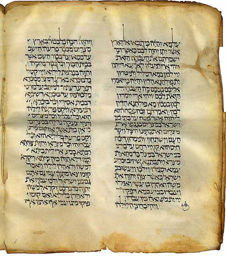 The earliest substantially complete copy of the bible was found on the Northwest shore of the Dead Sea. These Dead Sea Scrolls date from 150 BCE to 70 CE (see [Kenyon 1964] , Chapter 11, "The Last Thirty Years", by F. F. Bruce). However, there are fragments of quoted biblical text that date back as early as 600 BCE ([Charlesworth 1992], page 14). Enoch Hutchinson's Music of the Bible , published in 1864, also has a wealth of information in the area of biblical references to music ([Hutchinson 1864]). So, from a biblical perspective, Jubal was the first musician and inventor of musical instruments. There are many more references to music and flutes. Biblical references in the remainder of this section are taken from the New King James Version of the Bible, with equivalent books from the Tanakh (Jewish Bible) in «angle brackets», where the names are different. All references are from biblical texts that were originally written in classical Hebrew, except where noted. The classical Hebrew term “ugab” is taken to be “flute”, as is the classical Hebrew word “nehiloth", which is most likely the general term for perforated wind-instruments of all kinds. (NetBible translation, net.bible.org, fetched 1/3/2010). Why did you flee away secretly, and steal away from me, and not tell me; for I might have sent you away with joy and songs, with timbrel and harp? (Genesis «Bereishit» 31:27). After their triumphal passage of the Red Sea, Moses and the children of Israel sang their “Song of Deliverance, the Song of Moses” in Exodus «Shemot», chapter 15. The books that consitute The Major Prophets contain these references to music and flutes. The books of the New Testament were written within a much shorter timespan than the Old Testament, in the years between 50 A.D. and 100 A.D. They were written predominantly in Greek, with some section of Matthew originally in Aramaic. A lacquered side-blown bamboo flute called a “di” and a panflute called a “paixiao” were excavated from the Tomb of Marquis Yi of Zeng, located in the Hubei province of China. 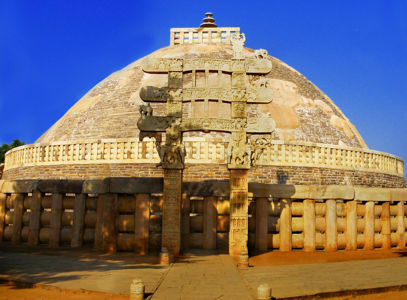 The tomb dates to 433 BCE. [Falkenhausen 1993]. 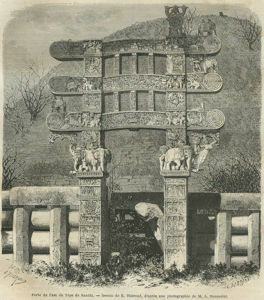 Sir James Fergusson published photographs of the shrine and its gates, which Thomas Lea Southgate refers to in 1908 when he mentions that “On these are sculptured several figures playing on the side-flute.” ([Fergusson 1873] and [Southgate 1908], page 168). 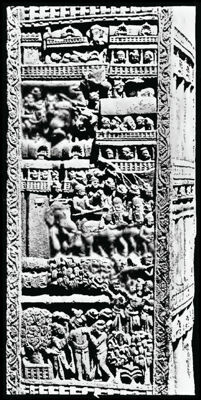 In 1917, Alfred Foucher and Frederick William Thomas provide more description of the sculpture titled “The Return to Kapilavastu” on the inner face of the right jam of the Eastern gate: “seven musicians of the royal orchestra, blowing oblique flutes and shells or beating drums.” They also provide a rather crude photograph of this sculpture, which is shown below next to a recent photograph of the detail of the music scene on the sculpture ([Foucher 1917], page 93 and Plate IX, number 2). Vulgar Latin was the everyday speech of the Roman people, as opposed to literary Latin. Old Provençal was a Romance language of the troubadors, spoken in Southern France before about 1500 CE. Provençal was a Romance language of several dialects in Southern France. Old French is the French language as it was written and spoken about 900–1400 CE. More than 90 percent of it was from Vulgar Latin, with a smattering of Celtic and Germanic, plus some M.L. learned terms. Anglo-French is the French dialect spoken in England from the Norman Conquest (1066 CE) through the Middle Ages. It was the administrative and legal language of England from the 12th through the 17th centuries. Middle English is the English language as written and spoken from about 1100–1500 CE. Modern English is the language of Britain and British America since the middle of the 16th centrury. So … from the language evidence, it appears that Latin is the primary root, proceeding through French dialects and Middle English spoken before 1500 CE, into modern Romance languages.